The Fullmetal Alchemist live-action movie was never going to have everything. It would be absurd to expect any director to gracefully condense 60-ish episodes of “everything” anime into a feature film acted by humans. 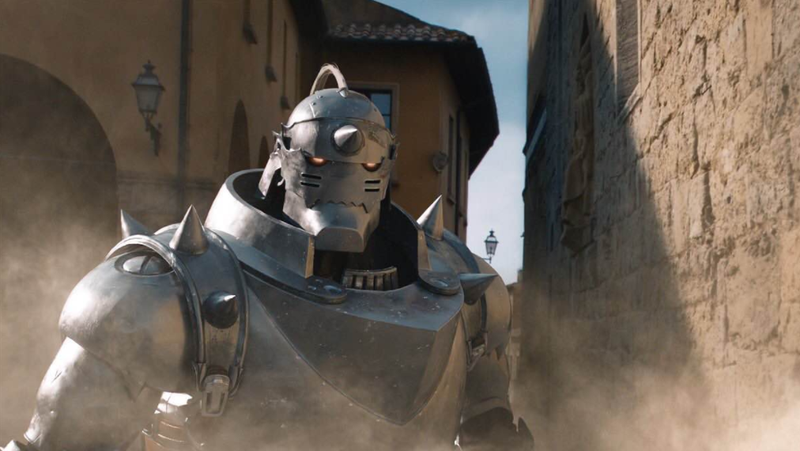 Pushing that expectation aside, the live-action Fullmetal Alchemist is a satisfying approximation of the anime’s spirit and standout plotlines with some very impressive special effects. Sure, there’s stuff missing, and missing context is what will likely leave newcomers with lots of questions about what the hell the plot is and who the hell these characters are. It’s a movie for Fullmetal Alchemist fans, and, as a diehard fan, I left yesterday’s premiere at Anime NYC contented and a little emotional. Fullmetal Alchemist, which releases in Japan December 1st, is a story about two brothers, Edward and Alphonse Elric, whose mother passed away when they were children. Their world is a place where alchemy—governed by a law of equivalent exchange—can instantly transmute stone into castles and iron into weapons. There are limits, though: transmuting a dead human into a live one is both impossible and unethical. Yet in a moment of desperation and dangerous insolence, Edward, who is a protege alchemist, decides to give it a go. The catastrophe that ensues costs Edward an arm and a leg and costs his brother his entire body. Edward quickly imprints Alphonse’s soul onto a nearby suit of armor, but the damage has been done. Their disastrous attempt at human transmutation spurs Edward’s quest to restore Alphonse’s body. The young alchemist’s first step is to become a State Alchemist, which could help lead him to the potentially apocryphal Philosopher’s Stone. The legendary gem ignores alchemy’s law of equivalent exchange and could, perhaps, help Alphonse get his body back. If you thought, Wow, that’s a lot, that’s just the anime’s first couple episodes. The live-action movie’s plot covers mama Elric’s death through the anime’s first arc, an arc that’s famous for its ability to make literally anybody sob. Two of the anime’s most tear-jerking plotlines are in there, and director Fumihiko Sori’s faithfulness to the anime definitely kept them tear-jerking. Tacked onto the end is a nonsensical but emotionally effective scene that strays pretty far from the anime. Sori’s casting choices are exquisite, despite his own misgivings about commissioning a Japanese cast to act out a story set in Europe. Ryôsuke Yamada, who plays Edward, is perfect parts hot-headed, emotional and self-depreciating. Yamada’s acting does well smoothing out the contractions in Edward’s character, in part because he leans into Edward’s intensity. Also of note were Dean Fujioka, who plays the morally ambiguous general Roy Mustang; Ryûta Satô, who plays the beloved and mirthful officer Maes Hughes; and Yasuko Matsuyuki, who plays the sociopathic monster Lust. I was surprised by how well the actors summoned their anime counterparts’ spirit without—for the most part—compromising nuance or distracting me with over-acting. I was also surprised by how often Fullmetal Alchemist made me laugh. Overall, Fullmetal Alchemist’s special effects were spectacular. One consistently pleasant surprise throughout the movie’s length was how well-animated Alphonse’s suit of armor is. It fights with the same impossible speed as it does in the anime and never feels hollow of humanity. Roy Mustang’s fire alchemy looks killer. The debris of Edward’s signature town-destroying fighting style feels substantial. The seven deadly sins incarnate—referred to as homunculi—are otherworldly terrifying (minus one or two small moments where the special effects falter). Fans will have issues with how the movie elides crucial context and some of the anime’s best characters (especially the heroic Major Armstrong). As I said, there was only so much time for a director to express the anime’s long-brewing undertones and nuances, but certainly there could have been a better way to explain key plot points like what philosopher’s stones do, who state alchemists are, what “Central” is, what the Ishval Civil war was and what Homunculi are. Often, characters’ motives for important actions were weak—especially the Homuncili’s and General Hakuro’s—and toward the movie’s end, plotlines frayed. Also, although Fullmetal Alchemist’s first fight scene is a 10/10, the high-adrenaline and beautifully choreographed fighting the anime is known for isn’t reflected much in the live-action movie. Adapting such a sprawling and beloved anime to the big screen is an ambitious feat, and given what’s possible, Fullmetal Alchemist turned out great. It was never going to replace one of the greatest anime series of all time, but it is a reverent and wildly fun supplement to it.